In the first half of November, senior Belarusian diplomats met with their counterparts from Lithuania and France. The meetings focused on economic cooperation. However, Europe has insisted on the need for further progress in the fields of human rights and democracy in Belarus. Trade, industrial cooperation and investments dominated the agenda of Belarusian Prime Minister Andrei Kobyakov’s visit to Pakistan and Turkey, this time without a human rights’ “aftertaste”. 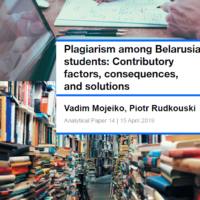 Falling export revenues have led to greater personal involvement by the head of government in advancing Belarus's economic interests abroad. The suspension of EU sanctions has had no visible effect on the dialogue between Minsk and Vilnius, which continued during the most difficult moments of relations between Belarus and Europe. On 9–10 November, the bilateral commission on trade and economic cooperation convened in Minsk for its 17th meeting. The delegations led by the economy ministers of the two countries, discussed cooperation in transport, transit, energy, protection of the environment, industry, agriculture and tourism. On 12 November, Belarusian foreign minister Vladimir Makei received his Lithuanian counterpart Linas Linkevičius. The agenda of their meeting, in addition to the issues discussed by the bilateral commission, included border infrastructure and the relations between Belarus and the European Union. In a Twitter message after the meeting with Makei, the Lithuanian minister called their talks “candid” and named three areas where irreversible progress was needed: human rights, a visa facilitation agreement and cooperation with the EU. He also underscored the need for transparency on Astraviec NPP. In fact, the issue of the nuclear facility, which Belarus is building 50 km from Vilnius, may have been the most difficult one at the last talks. Lithuanian Prime Minister Algirdas Butkevičius told journalists last week that Belarus failed to follow certain international agreements, which provide for an independent environmental assessment of the construction’s impact on neighbouring countries. Algirdas Butkevičius also strongly denied reports published by Russian media, claiming that Lithuania and Belarus had agreed on the construction of Astraviec NPP. He stressed that “Lithuania [was] not going to adapt any infrastructure to that power plant and [was] not going to buy electricity from Astraviec NPP”. In Minsk, Belarus and Lithuania agreed to hold an expert meeting in December to discuss Vilnius’ concerns. Despite a fruitful dialogue on economic and political issues, Belarus and Lithuania do not forget that they belong to two opposing military blocs. On 5 November, Vilnius county court found a former employee of state enterprise Oro Navigacija (Air Navigation) Romualdas Lipskis guilty of spying for Belarus. This has been the first espionage case that reached the court after the restoration of Lithuania's independence. Romualdas Lipskis was sentenced to three years and three months in a correction facility for having collected information about Lithuanian military and civil facilities. Prime Minister Andrei Kobyakov has become actively involved in the country’s diplomatic efforts lately aimed at opening new markets for Belarusian goods. 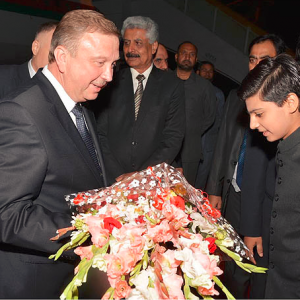 On 9-11 November, Andrei Kobyakov led a high-powered Belarusian delegation to Pakistan. In Islamabad, he met with his Pakistani counterpart Nawaz Sharif and spoke at the third Pakistan-Belarus Business and Investment Forum. The Belarusian prime minister called the existing trade turnover between the two countries ($60 million in 2014) a “statistical margin of error”. He nurtures the ambition of blowing it up to $1 billion dollars in a mid-term perspective. To achieve this target, the parties signed a programme titled “Roadmap for fast-track and middle-track economic cooperation between Pakistan and Belarus”. Pakistani media announced the signing of 18 bilateral documents (agreements, memoranda of understanding, protocols and programmes) while Kobyakov’s press service speaks of 17 documents. Belarus and Pakistan will focus on industrial cooperation, and agriculture and infrastructure development. Kobyakov’s press service has also avoided mentioning military cooperation among the topics for discussion, probably not willing to harm Belarus’ relations with India. Meanwhile, the Pakistani press have reported on the discussion of cooperation in defence and defence production, counter-terrorism and narcotics control. From Islamabad, Andrei Kobyakov flew directly to Istanbul. There, on 12 November, he spoke at the Belarusian Investment Forum. The prime minister announced Belarus’ new export market diversification strategy and called Turkey “a key place, a new springboard” for Belarus. Andrei Kobyakov met in Istanbul with President of Turkey Recep Tayyip Erdogan and several potential investors. In a similar way to Belarus's cooperation with Pakistan, Minsk places great hopes on setting up local assembly of traditional Belarusian goods, such as tractors, automobiles, road-building and mining machinery, as well as refrigerators with Turkey. In its trade with Turkey, Belarus also wants to achieve the “intermediate” target of $1 billion in turnover by 2016. The current figure stands at about $600 million. Deputy foreign minister Alena Kupchyna visited Paris on 5 – 6 November to speak on behalf of the delegation of Belarus at the 38th session of the General Conference of UNESCO. She also met with the organisation’s Director-General Irina Bokova. Kupchyna’s statement in the general debate has been a good sample of a ritual intervention enumerating ‘achievements’ and ‘priorities’ in Belarus’ relations with UNESCO. Recently, Belarus and UNESCO have not implemented any high-profile cooperation projects. No new sites from Belarus have been inscribed on the World Heritage List since 2005. Besides, there have been no new additions to the tentative list since 2004. In previous years, lower-level officials represented Belarus at the sessions of UNESCO’s General Conference. It may well be that the main reason for Kupchyna’s visit to Paris was to meet with senior French officials. Indeed, on 6 November, Alena Kupchyna met with Harlem Désir, Minister of State for European Affairs. The French diplomat, who has maintained regular contact with his Belarusian counterpart, became the first to break the news about the forthcoming suspension of EU sanctions against Belarus. The press services of both foreign ministries reported about France’s appreciation of the constructive role Belarus had played in helping to find a lasting solution to the Ukrainian crisis as well as the discussion of the development of bilateral economic relations. However, the Belarusian foreign ministry “forgot” to mention Harlem Désir’s call for Belarus’ efforts with respect to human rights and democratic principles. The Belarusian regime can hardly expect that France and other EU countries will satisfy themselves with the expansion of bilateral trade and Belarus’ “donorship of stability”. On Friday, Aleksandr Lukashenka approved a five-year plan for the deployment of a joint Belarus-Russian military group, which will be adopted at a forthcoming meeting with the Russian President. Just before this news became public, Delfi.it reported that US General Ben Hodges had lamented that a joint operation of Belarusian and Russian troops stationed in Kaliningrad might easily cut off NATO's Baltic members from the rest of the alliance. Yet the newest developments in the security sphere illustrate that such a situation looks extremely improbable. Aircraft Instead of a Russian Airbase? Just before the presidential elections in October Alyaksandr Lukashenka announced that he knew of no plans to establish a Russian airbase in Belarus. He later talked about it with President Putin in Kazakhstan. The results of their conversation became clear only indirectly, from ensuing events. Lukashenka apparently prevailed. That is, Minsk returned to its initial position: it needs only new Russian aircraft to defend the Belarusian part of the joint defence perimeter, not Russian bases on Belarusian soil. On 20 October the Commander of the Air Defence and Air Force of Belarus Major General Aleh Dvihalyou announced that Belarus is considering the possible acquisition of Russian Su-30SM fighter jets after 2020 to replace existing MiG-29s. On 23 October Defence Minister Raukou said that consultations on a prospective Russian base had been completed emphasising that he did not see any use for a Russian airbase in Belarus. In response to possible new NATO bases in neighbouring countries, he proposed that rather than establish a new Russian airbase, Belarus should acquire the means to eliminate these facilities. The implication of his statement was the need to acquire rocket and missile systems (like Palanez) which Belarus is developing now. On 31 October, Lukashenka himself commented on the prospective Russian airbase that “neither we nor Russia need.” He explained that in peacetime existing joint air defence forces should suffice and referred to Belarusian MiG-29s and Russian Su-27P fighter jets deployed in Baranavichy. The latter stay in Belarus on a temporary basis, and are a defensive type of Su-27 which can only interdict air targets. Talking about priorities in the development of armed forces, on 31 October, Lukashenka said that the government should focus on special operation forces, rapid response forces, intelligence and control systems. The army does exactly that. For instance, on 5-6 October, a joint Belarus-Russian company level tactical exercise took place at an exercise site in Vitsebsk Province. 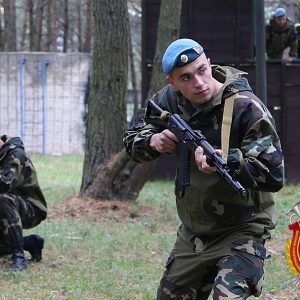 The paratrooper companies from the two countries drilled in a mock fight with illegal armed formation which crossed into Belarus from abroad. In the last week of October, 339th Mechanised Battalion hold tactical exercise of fighting intelligence-gathering and diversionary groups and illegal armed formations, also in urban areas. New equipment also shows that Minsk focuses on fighting armed groups like those which opposed Ukrainian army in Donbas. During recent Lukashenka's visit to 120th Mechanised Brigade, he inspected equipment and arms, and some of them prove that Belarus pays close attention to the current conflicts, especially in Eastern Ukraine. Thus, the Brigade demonstrated type of side-screen protecting tanks T-72, infantry fighting vehicle BMP-2 and APC BTR-80 against high-explosive anti-tank warheads. Even more remarkable was a decision to install a 23-mm anti-aircraft twin-barreled autocannon ZU-23-2 on Ural truck. This combination gives a mobile source of firepower widely used in local wars. All these measures means that Minsk is preparing for quite a low-technology local conflict like the one in Donbas. On 12 November official Belorusskaya Voennaya Gazeta reported that some time ago a decision on checking the entire equipment of the Belarusian armed forces had been taken. It failed to specify who, when and why it was taken. Most probably President Lukashenka ordered the check last year after he saw the disastrous consequences of neglecting military equipment in neighbouring Ukraine. This lack of equipment contributed to Kyiv losing control of Eastern Ukraine. Belorusskaya Voennaya Gazeta quoted the head of the Mechanised Armour Directorate of the Defence Ministry Colonel Aleh Famin as saying that all mechanised armour had been checked and found in good working order. He added, that earlier the army undertook a complete check-up of its military hardware every five or ten years, but now the leadership decided to do it more frequently. On 19 October the Russian TASS news agency quoted its source in the Russian defence industry as saying that according to the contract signed in September, Belarus would get 32 armoured personnel carrier BTR-82As. Later on, Belarus' Defence Minister Andrei Raukou said that his ministry was now applying for funds to pay for the new equipment. He said that the Belarusian army would nonetheless modernise the equipment it had and added that one new BTR-82A costs $900,000 while the overhaul and modernisation of an armoured personnel carrier (APC) already possessed by Belarusian army costs about $300,000. It sounded ambiguous: did he mean that the modernisation of an old APC was not worth doing, or vice versa? In addition, buying such a small quantity of equipment did not satisfy the needs of the army, although it could help strengthen special operations forces who are currently considered a priority. Yet on 30 October, President Lukashenka criticised buying bullet-proof vests, drones and armoured vehicles abroad. “I raise a simple question: why do we need that? Do not we have these items? Modernise what we have.” He emphasised that Belarus produced some of this equipment, and though its quality might be not on a par with world renowned brands, national industry and the army should work on improving domestic equipment. The Defence Ministry reacted rapidly. On 12 November the head of the Mechanised Armour Directorate, Famin reported that indeed the Ministry had studied the proposals for the modernisation of the BTR-70 submitted by the State Military Industrial Committee. Belarus has hundreds of these older APCs. On 10-12 October a high-level Chinese delegation led by Admiral Sun Jianguo, deputy chief of the general staff of China's Army, visited Belarus. Although Sun Jianguo is a key figure in the Chinese military hierarchy, Minsk provided zero information about the visit. The following news may indicate what issues have been discussed. After the visit, on 4 November, the Belarusian government announced success in the launching of production line rockets for the Palanez multiple-launch rocket systems in the Dzyarzhynsk District. The Palanez systems designed and built with Chinese assistance had been first demonstrated in May, yet Belarus first used Chinese-made rockets for them. Military expert Alyaksandr Alesin argued that China may have invested in the Dzyarzhynsk factory. Beijing is interested in promoting its own military exports and Belarus can be a showcase to advance Chinese products in the post-Soviet world.